← Europe, my lovely Europe! I love the Ukraine. (Ok, I love most places, it is why we travel. New people, new food, new landscapes, and few places have yet to disappoint). The one thing I do not love about the Ukraine is the police. Our brief foray into the country a couple of years ago was cut short because we were stopped and harassed every single day. As such we decided to leave and try Romania instead. (And by doing so we discovered a biker’s paradise). 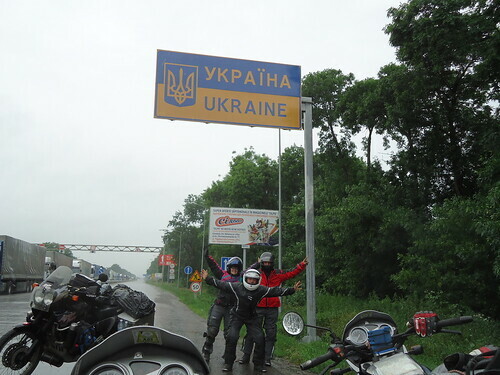 This time around we remained in Romania until the last possible minute, before rentering the Ukraine. I was looking forward to the food and the people, but not the police. As it was we were given instant issues. Of the 3 people we dealt with in passport control, one decided that he did not like Jannick. He even went so far as to say so. He pointed at me and said “no problem”, he pointed at Patrick and said “no problem”, and then he looked at Jannick and said “YOU I do not like. You think you are a viking.” He then proceeded to keep us for the next 20 minutes while he tried every possible thing to make Jannicks life uncomfortable. Finally we were allowed to go. The moral of the story? Do not pack an axe. Or if you are going to do so, bury it rather than attaching it just under the cover of your metal boxes. It makes border officials nervous.